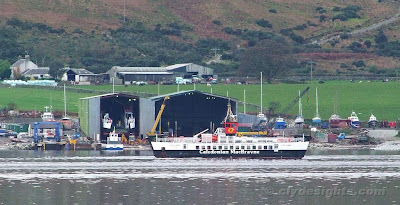 Waiting to be slipped at the Ardmaleish Boatbuilding yard on Tuesday afternoon was CalMac's LOCH LINNHE, a ferry which spends her summers working on the crossing from Tobermory to Kilchoan on the Ardnamurchan peninsula. During the winter months, she is found on a number of other routes undertaking relief work. Visible in the yard's shed is her sister LOCH RIDDON.